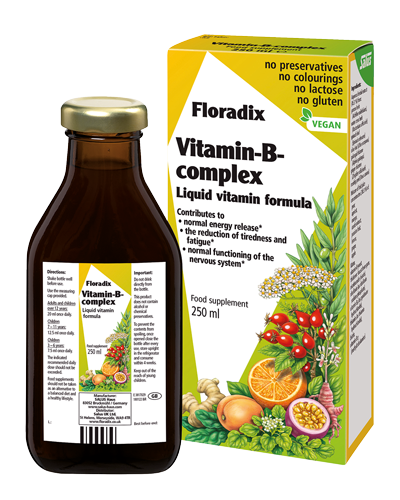 Floradix Tablets contain organic iron (II) from ferrous gluconate, vitamins B2, B6, B12 and C which contribute to the reduction of tiredness and fatigue and to normal energy-yielding metabolism. Iron contributes to normal red blood cell formation (supported by the vitamins B6 and B12) and haemoglobin formation. In addition, folate (folic acid) contributes to normal maternal tissue growth during pregnancy. Furthermore, vitamin C increases iron absorption. Floradix Tablets contain iron from ferrous gluconate which is a particularly absorbable form. 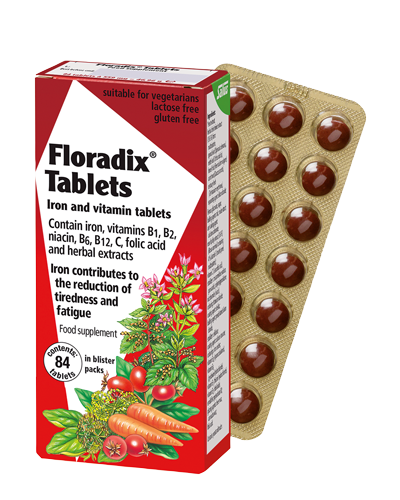 Floradix Tablets are easy to take and help safeguard the balance of iron, vitamins B1, B2, niacin, B6, B12, C and folic acid. Floradix Tablets contain extracts of selected herbs and rosehip. Floradix Tablets are gluten free and suitable for vegetarians. 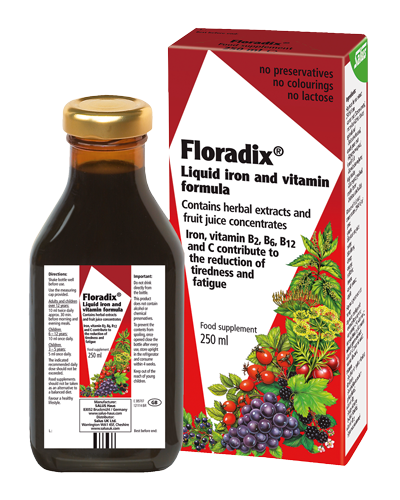 To maximise the iron absorption, take Floradix tablets on an empty stomach, approx. 30 minutes or more before a meal or 2 hours after. Adults and children over 12 years: 1 tablet, twice daily. 30 mins before a meal, with liquid. Available from independent health food stores, selected pharmacies, Holland & Barrett, Boots and many online health food retailers. Yeast extract, bulking agent: talc, herbal dried mixed extract 13.6 % from: maltodextrin, spinach leaf (Spinacia oleracea), nettle leaf (Urtica dioica), fennel fruit (Foeniculum vulgare), carrot root (Daucus carota), centaury herb (Centaurium erythraea), separating agent silicon dioxide. Sugar, Ferrous gluconate, maize starch, rose hip dry extract (3.6%) (Rosa canina) containing 4 % vitamin C (rosehip peel, maltodextrin), vitamin C (L-ascorbic acid), stabilizer (cross-linked sodium carboxy methyl cellulose, gum arabic, polyvinylpyrrolidone), nicotinamide (niacin), colour (titanium dioxide), glazing agent (shellac), anti-caking agent (calcium carbonate), bulking agent (silicon dioxide), stabilizer (cellulose), glazing agent (calcium salts of fatty acids), colours (iron oxides and hydroxides), vitamin B12 (cyanocobalamin), vitamin B6 (pyridoxine hydrochloride), vitamin B1 (thiamin hydrochloride), vitamin B2 (riboflavin), emulsifier (polysorbate 80), glazing agents (bees wax, carnauba wax), folic acid. Contains yeast and maize.